About 5 years ago I started a journey towards organization and simplicity. In my book, available in stores, I share some of the organizing, decluttering and simplifying tips I’ve learned along the way. 101 tips to be exact! Many of the tips included I’ve shared here on my blog at one point or another but they are scattered over 5 years of worth of blog posts, a little too labor intensive for anyone to have to go through. I’m so excited to be able to offer you this resource with consolidated information all in one place. One book with a ton of information to help you along in your own organizational journey. I’m very proud of the final product and I think the way it is organized and the layout and pictures are perfectly arranged for easy reading in small amounts of time. I was very careful about that because I know that finding large chunks of reading time isn’t always possible. Since my book is written in tip format and not in any particular order it takes the pressure off of having to read it like a novel. I’m hoping that by the time you finish reading my book you’ll be well on your way to becoming an organizing junkie too! It’s all part of my grand plan to get others “hooked” along with me, yay! Now in stores! Also available through Amazon.com, Amazon.ca or Chapters. My free gift to you: click here to download a Clutter Rehab Bookmark to help you stay on top of the PROCESS. Just print it double sided onto card stock and cut it out. It opens huge in pdf, just reduce the zoom to 100%. To read more about how this book came to be please visit this post. This is awesome! Congrats Laura! I am not into books but I will be getting this one. Was I on vacation when you announced this?…yep… Waaaah Hooooo!!! Good for you!!!! Oh wow!! Congratulations, you must be so excited!!! I pre-ordered it! Very excited. I just asked my library to buy your book, I can’t wait for it’s release! What wonderful news. Congratulations and cant’ wait to read it. I just got the book and gobble it down. I think it’s going to be a great tool to have a look at every time I need a little kick to get me on the go with a new project. Just by reading it, I was already starting to the feel “the high”. It was the boost I needed to start the new year with a clear vision in mind of what I want my home to be. Thank you for giving me the opportunity to review your book. I LOVED IT! Thanks for the great information you deliver to us. I ordered your book and it was delivered via UPS yesterday. I sat down and initially browsed through it. I took in the good lessons that you list and shared a few with my husband. 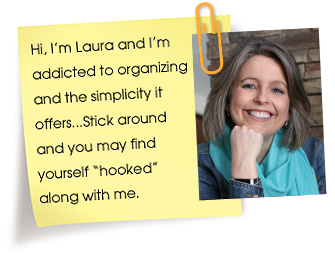 We both agree that you have some really great ideas and we are in the process of de-cluttering our lives. I’m a piler too. Then we we need to get the living room clean for company I stick the piles in my bedroom and now I have been piled out of my bedroom. Would love to read this book. I am a huge paper pile. I don’t know where it all comes from. I am trying to go paperless when finding info on the web but I tend to want to print it for reference later. I have had my computer crash and lose everything on it. Any suggestions on how to better store my info? I live in an old house that has been an enourmous challenge, in terms of fixing up/storage. We have been living in in/renovating and so, everytime we start on a room the contents of that room spill over and becomes another mess to de-clutter……….it’s been a nightmare!!! That has really been tremendously difficult to manage for me I would have to say. Slowly, I have added storage (closets,shelves), but I still have many areas around this house that need clearing out. With kids, dogs and A.D.D. husband, I can’t seem to get ahead……………I was always very organized as a single person!!! : ) Great website – thanks! Hi, I just bought your book on Kindle! Can’t wait to read and try to follow your 52 weeks of organization. I found you thru Cheapskate Mom’s blog.